If you are on the hunt for a new barbecue, you might want to take a look at the Rec Tec RT-680 Pellet Grill. If you like the flavor of cooking with wood pellets, but the convenience of quick ignition and temperature control, it might just be the right option for you. 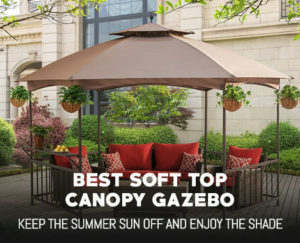 It is not exactly the least expensive option out there, but the durable build, the smart design, and the awesome performance it brings to the table are all well worth the investment. We’ve previously taken a look at cooking with wood pellets, so now, let’s take an in depth look at the Rec Tec RT-680 Pellet Grill, what it’s all about, and what it can do for you. There is absolutely no doubt about the fact that the Rec Tec RT-680 Pellet Grill is a very high quality pellet grill. As we mentioned, it is not the cheapest grill out there by any stretch, however price is not the only thing we look at. Most people, including us, have no problem spending a few extra bucks on a high quality product like the Rec Tec RT-680 Pellet Grill if it means purchasing a solid product. Making the investment and spending a little more is always worth it when it means that you have a BBQ that doesn’t fall into pieces if you look at it the wrong way. 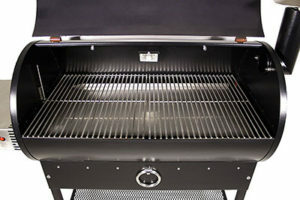 When it comes to the build quality, there is really nothing bad that we can say about the Rec Rec RT-680 Pellet Grill. This big guy is made out of stainless steel for the most part, which is probably the best thing out there in terms of a BBQ. Stainless steel is tough, it has a very high level of heat tolerance, it’s hard to scratch, and a bit of rain won’t ruin its day. This is a tough customer no doubt. 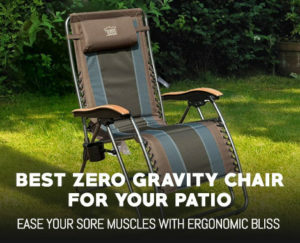 There is also the fact that the whole thing features welded seams for extra durability. In other words, the lid won’t snap off in your fingers if you are a little rough with it. The Rec Tec RT-680 Pellet Grill is also powder coated for some extra outdoor protection, plus it features something called triple redundant weather protection. No, it will not be able to handle an F8 tornado or hurricane Katrina, but it can definitely stand up to a bit of rain and wind. Furthermore, the 10 gauge baked on porcelain lid is about as tough as can be. It keeps heat in and keeps the rain out, just like it is supposed to. The Rec Tec RT-680 Pellet Grill is built like an MMA fighter. It’s big, it’s tough, and it’s definitely hungry. Just like with the build quality, the overall design is top notch. The Rec Tec RT-680 Pellet Grill comes with enough cooking space for a full chicken or turkey, if you prefer burgers it can fit dozens of those too. It is a fairly spacious grill with lots of room, so it is a bit heavy, but at least it comes with wheels so you can pull it around instead of having to do any physical labor besides flipping meat. 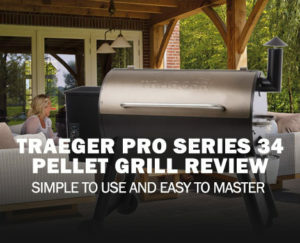 The fact that this is a pellet grill that produces an awesome smoky flavor and uses a high quality ceramic ignition system combined with a pellet feeding auger is pretty cool too. Heck the hopper can fit 40 pounds of pellets for near endless barbecuing. The whole thing is made of stainless steel, plus the hopper lid can even be used as a warming area. Just so we don’t bore you with the design, let’s quickly list some of the best design aspects of the Rec Rec RT-680 Pellet Grill. One thing that we definitely cannot argue with when it comes to the Rec Tec RT-680 Pellet Grill is how well it performs. There’s a reason we’re doing a review on it and it isn’t to tell you that it did a bad job cooking our steaks. First off, perhaps our favorite part about this pellet grill is that it brings us the best of both worlds. Yes, this is a wood pellet grill, so it does bring you that awesome smoky flavor that just can’t be beat. However, at the same time, it also comes with an easy ignition system for quick lighting. You don’t have to burn your hands building a fire to get the Rec Tec RT-680 Pellet Grill going strong. Simply click a button, wait a few minutes, and you are ready to cook as much chicken as you can handle. Being easily turned on might not be the best feature if you are human, but it certainly is if you are a BBQ! Also, the Rec Tec RT-680 Pellet Grill comes with intuitive temperature controls, something else that other wood and charcoal grills just don’t have. This allows you to set the temperature very accurately, so you can cook your meat without paying a constant guessing game. You’ll find the RT-680 heats up surprisingly fast, which is impressive seeing as it is quite spacious. It can reach temperatures of over 500 degrees in just under 10 minutes, which is more than hot enough to grill any food. What is pretty cool is that this thing uses a proprietary algorithm to maintain a constant heat level, something else other BBQs seem to have forgotten about. You never have to worry about feeding pellets into it while you grill because the hopper holds more than enough for several hours of grilling, plus the auger feeds them in automatically as the stock is burnt up. Also, a nice little re-circulation fan helps to distribute the flames and the heat to ensure consistent cooking. In other words, all of your meat will be grilled evenly instead of black in the back and raw in the front. Now, what we really like here is how the Extreme Smoke Feature performs. If the name of it doesn’t give it all away, well, you’ll love the Rec Tec RT-680 Pellet Grill if you like a strong smoky flavor. Just turn it on, use the smoke feature, and you’re good to go. All in all, the Rec Tec RT-680 Pellet Grill performs very well indeed. It is easy to turn on, it heats up fast, and it has precise heat distribution, with an extra smoky kick. Don’t forget that the steel rod grill grates stop food from sticking, they heat up quick, and they give you those great grill marks too. The bottom line here is that the Rec Tec RT-680 Pellet Grill is above and beyond most other grills that we have seen to date. This monster can handle a whole lot of food and is about as durable as a BBQ can be. If you’re hungry (and we know you are) it provides you with some of the best grilled meat and veggies imaginable. Check out the Rec Tec RT-680 Pellet Grill if you’re interested in happy guests, incredibly BBQ and a lifelong grilling companion. If perhaps you’re still looking for a more versatile piece of gear, you might be interested in check out some smoker grill combo units. Are replacement handles for the rt 680 available for purchasing? 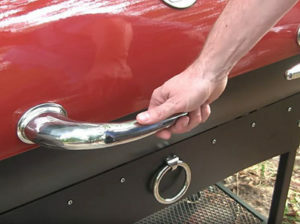 Hey Glenn, replacement handles are available but they are the pull bar style not the original type. You can find them here.